This is another in the Expanding Paradigms Series. In this post we will take a look at the role of Teacher as Itinerant/Rabbi. It doesn’t matter which side of a coin you are looking at. Heads spends like a quarter and tails spends like a quarter. Heads or tails, they’re both 25¢. In the Apostolic paradigm, you find two sides of the same coin: Paul and Peter. Both men are manifestations of Apostolic intelligence, but the two minister in very different ways. Peter plants new life in the existing church and Paul plants new churches where they don’t exist. What I want to establish is that the Apostolic is one role with two sides to it: what can be identified as the Resident (Peter) and the Itinerant (Paul). It’s a Split Definitive™ (my term). If you take a step back and look from some altitude, we find that each of the 5 gifts have this duality in common. So, in the same way, The Teacher is one role with two sides to it, the resident and the itinerant. As Resident, the Teacher operates in very Greek/Western paradigm where a classroom or a pulpit is their theater. The Teacher disseminates information for the purpose of helping “students” understand the Christian faith. The resident stays in a particular location, the local church or seminary – or today, I guess you say Youtube, Podcast, Blog, Books – and funnels information from thousands of years of sources into a congregation. This has been a very faithful model within the established church, but it hasn’t produced disciples the way we imagined it would. Our minds can become so fat with knowledge of our faith, that our hearts become too lethargic to exercise the mission of our faith. There’s nothing wrong with resident teachers. We have come so far because of them. But at this point in history, we find that we need them less than we do the counterpart. In fact, we’ve never needed the itinerant teacher more. The Itinerant teacher is like the Rabbi, a Hebrew model. Remember the scene in The Last Crusade where Indiana is teaching a classroom full of adoring young women who have made him the idol of their desire and worship. It’s hysterically funny! In the following scene, Jones can barely get into his office for the horde that wants to have “one on one” time with him. It’s hyperbole, but the resident teachers really can build up a fan base like this. 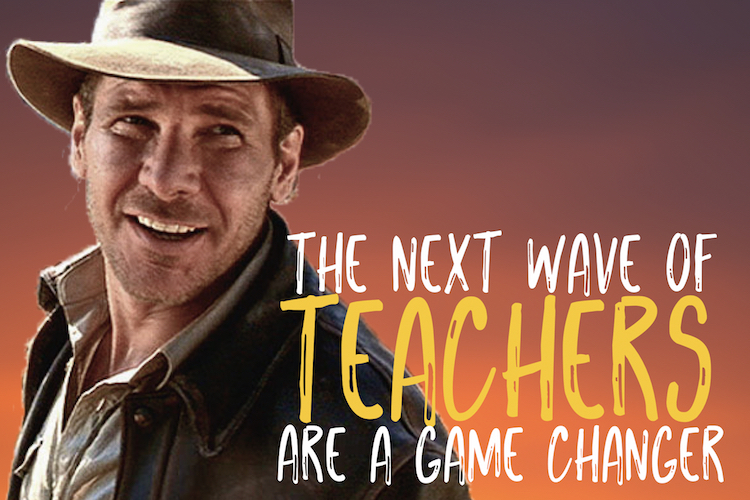 Can you imagine if Indy was a resident teacher the whole time, in all four movies? It’s important to know what ‘neo-lithic’ stone is, but we have Khan Academy. I don’t want Indiana Jones to stand at the chalk board. I want him outrunning homicidal boulders that are about to flatten him. What we want, and what we need, and what the Church needs is for Teachers to drop the chalk, leave the classroom, go out into the field where unimaginable risk and unmitigated danger mold disciples into the shape of Jesus. Did you catch that? Mary calls Jesus “Rabbi” – Teacher. But wait, Jesus didn’t have Powerpoint. There must have been something fundamentally different about the way Jesus understood the role of Teacher. We don’t see him pop in for an hour on Sunday and guide a room full of people through an N.T. Wright book. He was itinerant. He was “life on life”. He was out of the classroom and in the field. He was outrunning natives with nerve paralyzing darts. OK, maybe not so much that one. Looking at Jesus as the template for Teacher is a paradigm shift in terms of how we view the role and how we exercise the gift. If we want to make disciples, look to Jesus the teacher. If we want to see learning become transformation, look to Jesus the teacher. If we want to see lives changed, look to Jesus the teacher. As Rabbi, Jesus taught by walking. He practiced the Hebrew model of teaching, a Rabbinic model. Remember that time Jesus was in the classroom and everyone passed the final? Of course not, because it didn’t happen. Jesus pushed his students out into the field, where they learned in all five technicolor senses. Go back through the Gospels and watch how Jesus teaches. We need more Itinerant Teachers – Disciple Makers – to drop the chalk and pick up the walk; more teachers willing to take on a few learners, add them to the shape of their day and night rhythm and teach them to live a new kind of life, the way Jesus did. If we want to see lives changed, we don’t need to see books opened, we need to see hearts opened. Let me be clear: we can be affected, emotionally, intellectually challenged because of something we read, study and learn, but we can stay the same, untransformed, un-discipled. When we walk with a discipler into the mission field, into new paradigms, into difficult experiences that we wouldn’t choose for ourselves – there will be transformation. We will see new ways and understand old things differently. I’m afraid that one of the major obstacles to the Church becoming what it’s supposed to become, being what it is supposed to be, is an anemic representation of the role of “Teacher”. When we watch Indiana Jones, we watch the whole movie – the whole adventure – over and over, but when it comes to ‘going to church’ we view the clip above on repeat. We want to learn about things we aren’t convinced we’ll ever want to actually do. [A] We know what mission is, but we find every excuse in the book to avoid it. [P] We talk about holiness, and we talk about it so much, we believe we’ve attained it. [E] We know what salvation is, but we’ve never invited anyone to enter into it. [S] We value community, but we don’t really want it outside the walls we meet in on Sunday. [T] We are insatiable learners, but lack the motivation to exercise our knowledge – to burn classroom calories. Jesus did many things inside the temple, but he taught his disciples outside the temple. They saw his faith at work in the streets. They watched as he risked everything based on his believing. They saw his prayers answered in godly devotion. Teachers, it’s time to leave the classroom and get into the field. The shaping of the Church to come is going to rely on Rabbis in the field, men and women modeling their gifting mostly on Jesus, but a little on Indiana Jones. Teachers, we will follow you (even if there are nerve paralyzing darts involved). Join the conversation! What are your thoughts? Have we moved the boundaries of what it means to be a Teacher too far? Has anything struck a chord?